Ever wanted to know what the inside of your mouth looks like closeup? 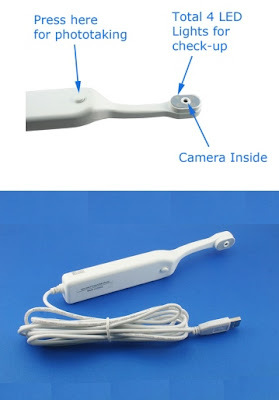 Me neither, but now it’s possible with the USB Dental Camera, a toothbrush shaped USB camera. The camera has 30-50x magnification, 4 intense white LED lights, auto/manual focus, and can take 300k resolution images. I’d be scared as hell to see what my teeth look like at 50x magnified. I’ll leave that for the dentist, thank you very much.